What is the Difference Between Butternuts and Black Walnuts? Saturday, September 28, 1912: Mater went to a sale today. I got busy this afternoon and went for to gather some butternuts. Was rewarded by getting almost a bushel, any way it was dreadful heavy to carry, but I got them home at last. I never heard of butternuts until I read this diary. What are they? What does a butternut tree look like? Are there still any butternut trees around? Butternut: Also known as White Walnut, this relative of Black Walnut is slower growing and much less frequently encountered than its well-known cousin. Butternut prefers moist bottomlands and ravines like Black Walnut, but its lightweight wood is beige-pink in color and is not nearly as sought-out for making veneer and furniture. Its kernel within the fruit gives it the common name of Butternut, as it is sweet and very oily. 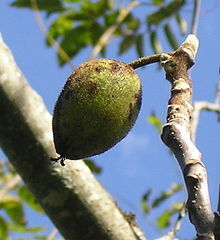 Butternut trees have oval nuts; black walnuts have round nuts. I now realize that maybe I can’t tell the difference between butternut and black walnut trees—and that I’ll need to look more carefully the next time I see a walnut tree to figure out which type it is. Last week-end my husband and I gathered black walnuts. We hulled them and set them out to dry. I can hardly wait until they are dry enough to crack and use. I absolutely love their wonderful complex, sharp, rich, nutty taste in cakes and cookies. Posted on September 28, 2012 October 7, 2013 by SherylPosted in Farming and GardeningTagged diary, family history, genealogy, hundred years ago. I also like black walnuts. They have a nice rich taste. Sometimes I think that our grandparents ate a wider range of foods with rich, complex tastes than what we do today. Gathering walnuts is a fun activity on a nice fall day. And, then we just spread them out on newspapers to dry after we’ve hulled them. I turn them once or twice so that all side get exposed to the air. When I hear the term butternut, I tend to think of butternut squash, rather than about the nut. And, I learned something from your comment–I hadn’t realized that Mater was Latin for mother. I’d just thought it was a slang term she used. My mother talked about butternuts, and my dad’s parents had black walnuts on their farm. But I still don’t know the difference. I know an older man who is a wood-carver. Perhaps I will get the chance to ask him. it you find anything out, let us know. It’s kind of amazing how some trees that apparently once were common, we now either don’t know how to identify or they are rare. As I have both black walnut and butternut, I can tell you how to tell the difference between the two… At least when they haven’t been shucked yet!! The walnut is very round whereas the butternut has a football (American not British) shape to it. Hope this helps you both to identify them! I’m glad to know that there still are a few around. G’day, I’m going to seem like a real “drongo” here … but, as an Australian, when I saw the word “butternut” my brain immediately swung to Butternut Pumpkins. ha ha ha… have no idea, at all, about “gathering” black walnuts/butternuts etc. Do you go out into your back yard or into the woods? My husband and I gathered the walnuts that fell off a tree in a park. I think that many walnut trees were planted years ago–and they are often found in parks and along roads, as well as in yards and overgrown fields. Thanks for your reply Sheryl. How wonderful that Walnut Trees are so prolific in your “neck of the woods”. My neighbours had a strong and vigorous Walnut Tree but the “Cockies” (Sulphur Crested Cockatoos) developed a liking for it and, after about 3-4years of ripping the walnuts off/ ripping the bark off, that beautiful tree finally “turned up it’s toes” and died. I googled Sulphur Crested Cockatoos to find out what they look like. They are beautiful–even if very destructive. They are stunning beautiful, Sheryl, and noisy when arguing over a “tasty morsel” which may be part of your wooden window frame. Cheeky beggars!!! Glad few people now keep them in little cages, as pets, like when I was a child!!! It sounds like so much fun to be able to see them outside your window. In the US, some people still keep some type of cockatoos as pets. (I’m not sure whether they are sulphur crested or if they are a different type). I don’t know much about it, but my sense is that, unless the owner is very experienced with birds, that they often don’t do very well. The difference between Butternut and Black Walnut. I have over 100 young black walnut trees and my friend has at least one old butternut tree. I have not compared the bark or the leaves, but I do gather the fruit. Butternut nuts have sharper spines on the shells, that’s how I tell the difference. I have not read all the above comments, but in Eastern Ontario, Canada, butternut trees are a species at risk because of a fungal canker. So sad. 😦 I find that black walnuts are gorgeous trees, but so many people do not like them because not much will grow under their large canopies. I think the population in general needs to be more educated about eating locally grown, wild nuts. Yum! It’s sad to hear that the butternut trees are at risk in Ontario. I’m not sure of their status in the U.S., but I don’t think that they are a very commonly seen tree anymore, so there may be similar issues. It’s too bad that so few people eat the wild nuts. They don’t know what they are missing. I can remember gathering black walnuts when I was a child–and then I gathered a few in 2011 to replicate what my grandmother was doing in her diary. I enjoyed them so much that I’ve continued to gather them each year since then–and over time I’ve become more proficient at cracking them and extracting the nuts from the shell. Thanks for sharing the link. Hopefully Ontario will be able preserve this species. Just found this blog today and was interested in the discussion about butternuts. I have eaten butternuts only once after my parents purchased some at a roadside stand in Vermont. This was probably around 1960. They were so delicious! I recently found a recipe for Butternut Pie in an old cookbook my grandmother had. I am going to Vermont this weekend and hope I can find some to buy though it might be too early in the season. I’ll keep my fingers crossed that you find some so that you can make the Butternut Pie recipe. I’m intrigued by it, and hope you’ll tell us how it turned out if you make it. If you are willing to share this butternut pie recipe, I would be appreciative!! Like Sheryl’s 100 year old recipes, this recipe for Butternut Pie, from my grandmother’s cookbook, is a bit vague in detail: Yolks of two eggs, sugar to sweeten, one cup of chopped butternut meats, cream to fill pie. Bake with one crust and frost with whites of eggs. I never heard of butternut until we purchased a house with a butternut tree in the back yard. We have now been here for more than 30 years. The squirrels love the butternuts but I would never know how to use them in a recipe. I suspect walnuts like a warmer climate. Do you have any idea what zone you are? We are zone 3. Lots of oak trees but not many walnut trees. I found 2 butternut trees growing on our dead end road, and at least 8 walnut trees, I had to look up the differences between the 2. my wife said her grandmother used them in cakes, but said thy were rare, I guess we are lucky because both trees are loaded with them, We also have many black walnut trees growing in our area, also, lots of Squirrels , they probably planted them. We see these all the time here and my husband says they ‘re walnuts I’ll have to tell him they’re “butternuts”! Thanks! It’s awesome that you have butternuts. I don’t think that they are very common around here.